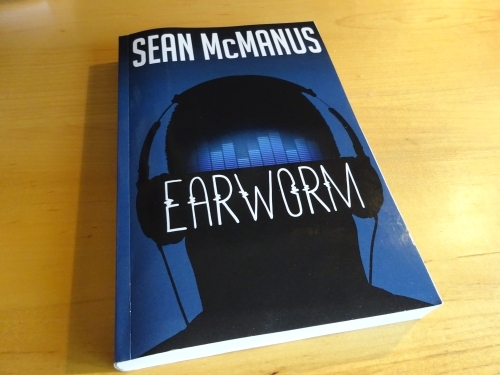 Earworm, my novel about the music industry, is out today in print and on Kindle. The book was previously published under the title University of Death and received some great magazine reviews, but has never been available on Amazon until now. Earworm - out now in print and on Kindle! The book is a techno-thriller that explores how fans relate to their favourite bands, how businesses can use technology to manipulate consumers, and what would happen if the music business disappeared overnight. The cast of characters includes the band University of Death, fighting to survive as a heritage act in an industry that's falling apart; and Goblin, a band formed by Simon and Fred who are desperately trying to claw their way in to the music business for the first time. They all become embroiled in a conspiracy that could make or break the music industry. There were a couple of reasons for wanting to get it on Amazon. Firstly, I decided the book deserved every chance to find its readers, and Amazon is where most people buy books, for themselves or as gifts. It's frictionless because almost everyone has an account there. Secondly, putting it on Kindle enables me to make it available much more cheaply than I can in print. The book originally predates the Kindle, but novels clearly need a presence on Kindle if they are to reach many readers today. Amazon estimates the book provides 7 hours and 23 minutes of entertainment, and it took two years to create, and has had fantastic press reviews, so it's a snip at £2 or $3. If you're not sure, please read the first few chapters on the Amazon Kindle page to see if it's for you, and if you can't buy it now, consider adding it to your Amazon wishlist. Earworm is enrolled in Amazon Matchbook so if you buy the print edition you can get the Kindle edition for free (check Amazon for details, only available in the US). The book has been remastered (in music biz speak) for this edition, with minor updates and edits, a cleaner design and a new title (with thanks to Andy Lawn for suggesting it). You can buy the book through the links in my shop here, and find out more about the book here. If you're outside the UK or US, the book should be available if you search in your local Amazon store. If you know someone else who might be interested, please let them know, or consider sharing the book's page on your social networks. It's really hard to promote novels, so all help is appreciated. Super Skills: How to Code is out now! 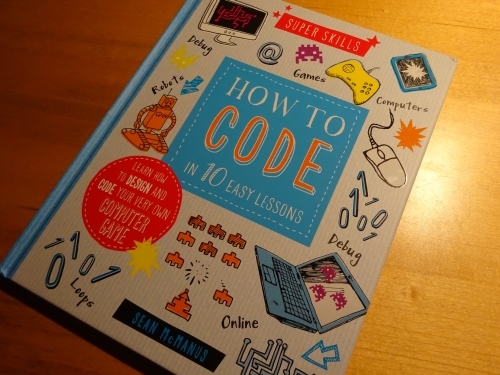 I've just got a first look at my new book, Super Skills: How to Code, which is out now. The book aims to teach young readers some of the fundamental concepts of programming, using Scratch to demonstrate them, and introduces basic HTML and CSS for building web pages. It features colourful illustrations and has a spiral binding that means it stays flat on the desk when you're copying the code or using it as a reference. It has a cover that wraps around the spiral binding to protect it. Following the book, you can build a number of games and demos, and your first web page. It's published by QED Publishing, with different editions in the UK and the US, and a separate edition available with library binding. You can find links for ordering the book in my shop here. One of my favourite projects in the book is a platform game, which readers can easily customise with their own designs. There's an extended version of the game with multiple levels below. To play it you will need a Flash-compatible device. To get the very best out of Scratch, and work within the confines of a short (but powerful!) book, I've focused on Scratch 2.0. That means some of the examples won't work on the Raspberry Pi or on computers that still use the old version of Scratch. Since Scratch 2.0 is available online for free, I hope that this won't spoil anybody's enjoyment. For more information on the book, including sample pages, the example code, and some further reading, check out my page for Super Skills: How to Code. I put a couple of Easter eggs on that page too. For titles for even younger readers, check out Max Wainewright's How to Code series, for which I was the technical consultant. For those who want to dig deeper into the topics and languages introduced in this title, check out my books Scratch Programming in Easy Steps, Web Design in Easy Steps and Raspberry Pi For Dummies.